Karin Griffin has extensive skills and experience playing with some of the worlds leading musicians, reading & sight reading, written music & chord charts or improvising in most musical styles and genre from Classical Orchestral works and West End Shows to Baroque to Rock and Roll, Gypsy Jazz to Beethoven, Folk, Country and Western, Bee Bop, Jazz Fusion, Progressive Rock and most in between. Karin has been privileged to share the stage with such greats as: Eric Clapton, Henry Mancini, Dizzy Gillespie, Larry Adler & Sinead O’Connor and regularly worked with the Royal Philharmonic and BBC Concert Orchestras, performed on films such as Licence to Kill and Mad Max, starting her career in Melbourne with the Brian May and the ABC Melbourne Showband she brings a breadth and depth of unusual performance skills. 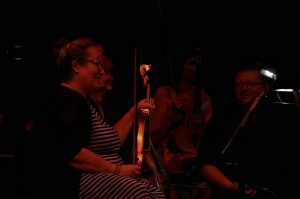 She has played acoustic and electric violin in bands since the late 70’s and has the unusual added experience from the 80’s of working at Ronnie Scott’s Club as their resident sound engineer for about 8months. Karin has performed in Brisbane as guest artist with Jon English and Peter Cupples, Tom Foolery, The Duke, Virginia Sook, and at venues like the Brisbane Jazz Club, the Brooklyn Standard and as a member of the group, “3 Drink Limit”. She has just recently returned in October 2017 to Perth Western Australia where she lead the Perth International Orchestra in Neil Diamond Hot August Night The Concert at the Crown Theatre Perth. Karin is available for orchestral, ballet and opera work, shows, sessions and recordings, weddings, corporate functions, and gigs so if you are interested please contact her.